There have been a few times a blogger I’ve followed stops posting, unexpectedly. I always hope they are alright and will return, but life happens. This time it was me. Things were humming along and I suddenly dropped off the face of the earth. Multiple circle trips from Michigan to Florida and South Carolina were needed to help move my mother to assisted living and handle some of her affairs. This had me out of town frequently throughout the fall. At the same time, the many changes at work it made it difficult to keep up and I gave my employer notice. I was looking forward to more time for family and sewing, but everything came to a screeching halt in December. I thought the floaters and flashes in my left eye were due to stress, then a grey cloudiness moved into my vision. My lovely optometrist referred me to a great retinal surgeon and within days I had surgery for a retinal detachment. The surgery was a breeze, but the recovery has been long. I’ve been sewing some, but but my vision still has some distortion and I need to limit my computer time. Since a January trip to San Francisco was planned and booked months ago, I carefully followed all the doctor’s instructions to make sure I recovered enough to be allowed to fly. 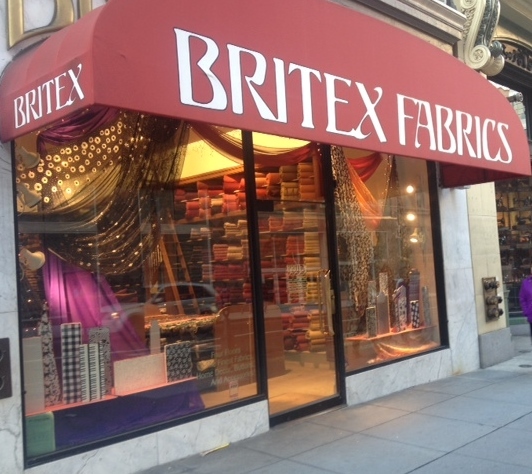 There was no way I was going to miss a visit to Britex Fabrics. My husband was attending a convention and we stayed in Union Square, conveniently located about 3 blocks from the 4 floors of Britex at 146 Geary St. The store keeps some high style company, Jimmy Choo and Chanel on one side and YSL and Valentino on the other. 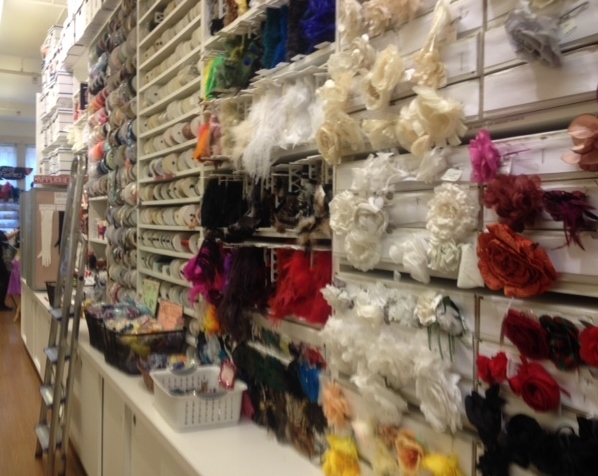 Four floors of fabric and notion nirvana. As soon as I walked in there was a familiar face. 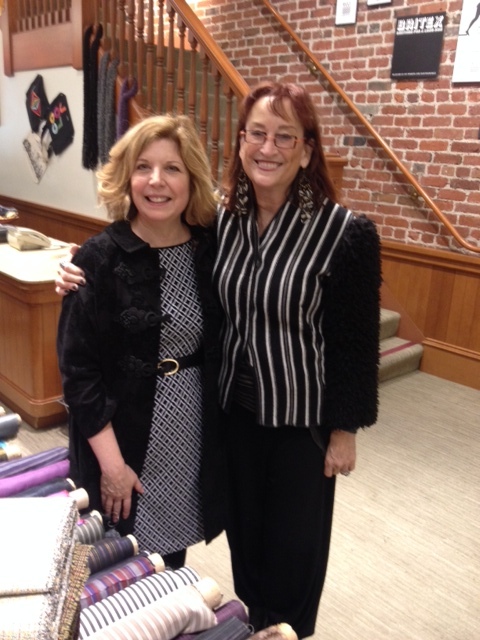 Sandra Bedzina was in the store teaching a class. What lucky students, shopping and Sandra all in one place. 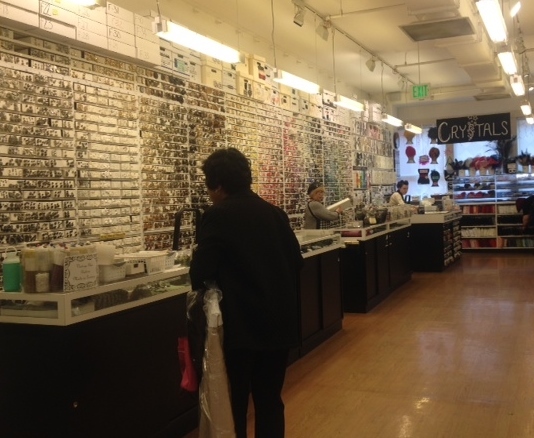 For someone not familiar with the store, is it possible to plan for a visit to a place like this and just how would one do that? Make a list, research the web site, review the existing stash? 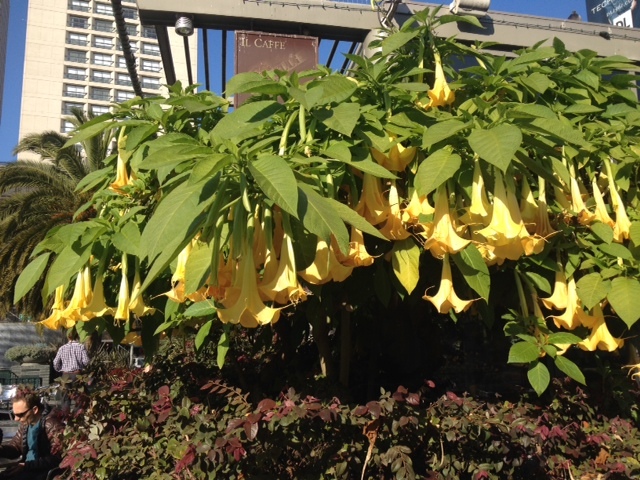 I did none of that and not having any expectations, I was a little overwhelmed. 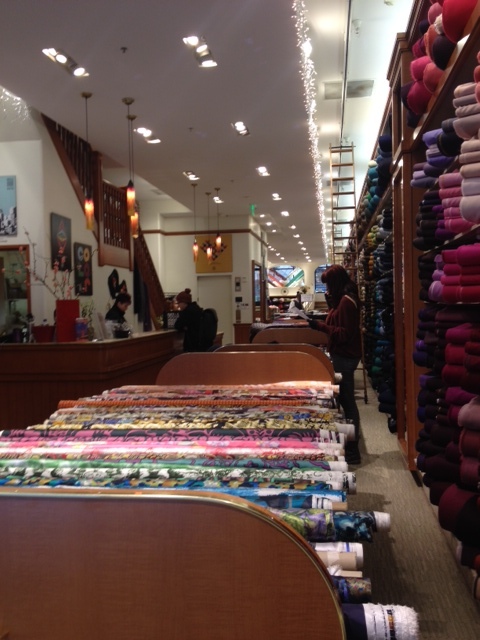 Maybe it was my deer-in-headlights look while wandering the vast sea of lovely wools and silks on the first floor, more likely it’s the frequency of dazed visitors, that had one of the very experienced sales staff suggest starting on the 4th floor and working downwards. 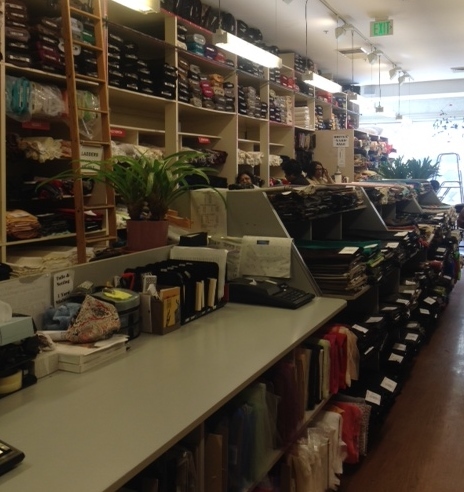 3rd Floor- Notions & accessories, buttons & bridal, ribbons & trims, buckles & tassels, patterns & books. Another familiar found on the first floor. 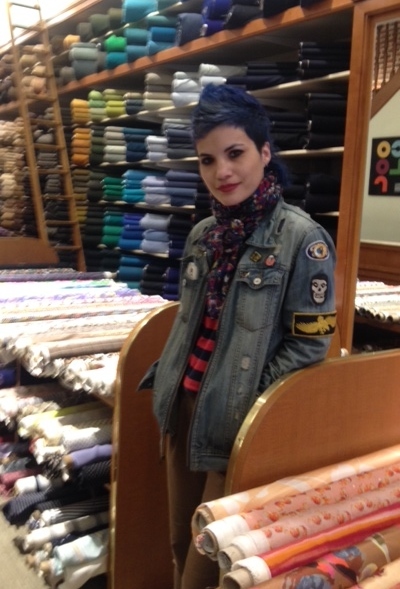 Emily Payne from Project Runway season 13, with her fabulous blue hair enhanced by the blue woolens behind her. She was to teach a draping class there a few days after my visit, wouldn’t that be fun? 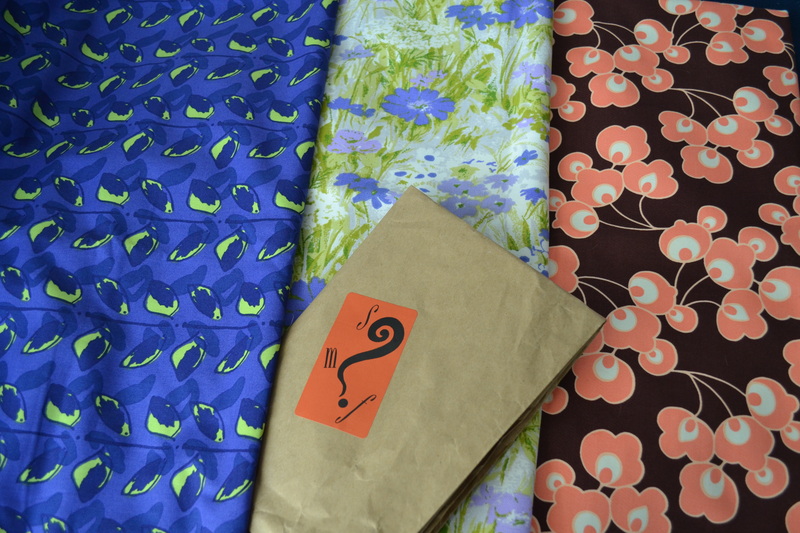 Britx provides a visual feast of color, pattern and inspiration, well worth a return visit. 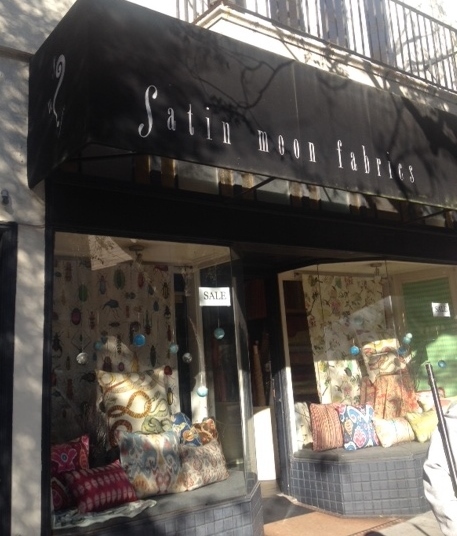 Satin Moon Fabrics, 32 Clement St, is a small, cute place in a sweet neighborhood. 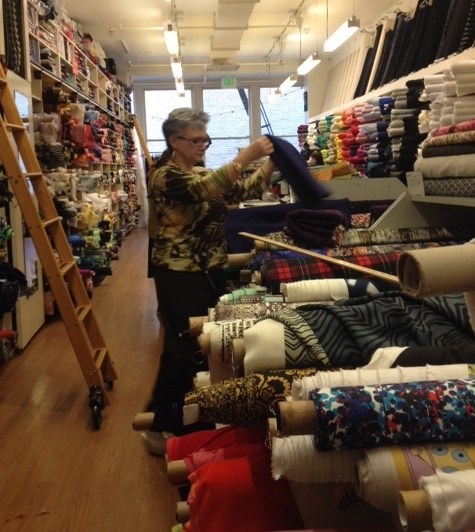 It was fun to listen to the sister/owners as they helped customers and talked about what was going on in the sewing world. 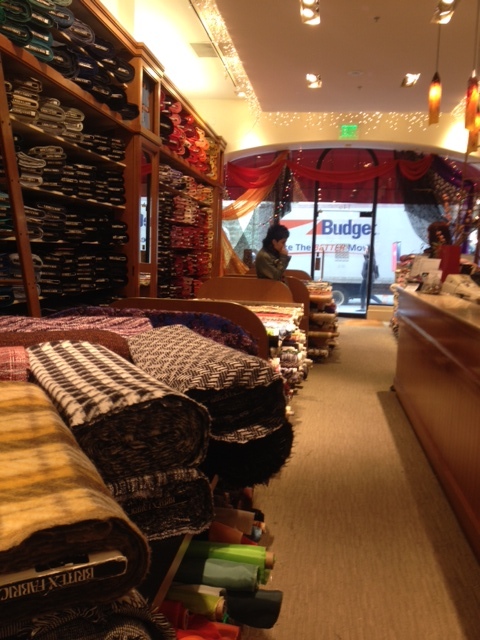 The store includes quality fashion fabric and home dec, with some patterns and trims squeezed in. They had some beautiful laces and silks, but I was thinking cotton prints for spring. 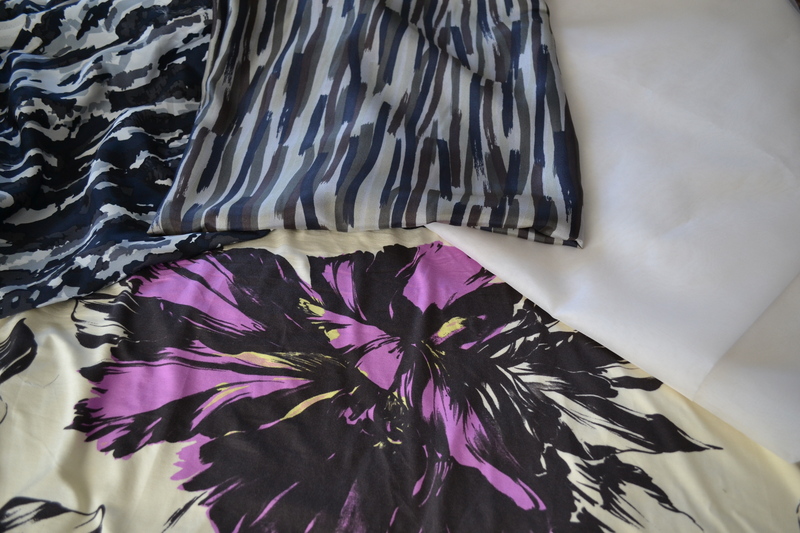 Purchases – all cottons, with plans for a dress, and 2 skirts. 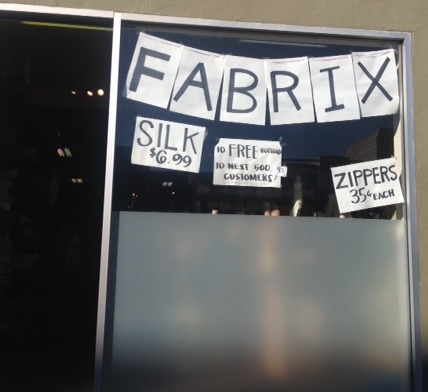 Fabrix is now at 432 Clement St. It was originally at 101 and across the street from Satin Moon, but recently relocated down a few blocks (according to the Satin Moon sisters, it was due to updates needed to retrofit the building for required earthquake regulations). The bare bones store seems to have a rather random inventory of bolt ends and overruns, but I picked up some white silk organza and 2 silk prints for linings. The large floral is a knit that will be fun to play with the pattern placement on a dress. 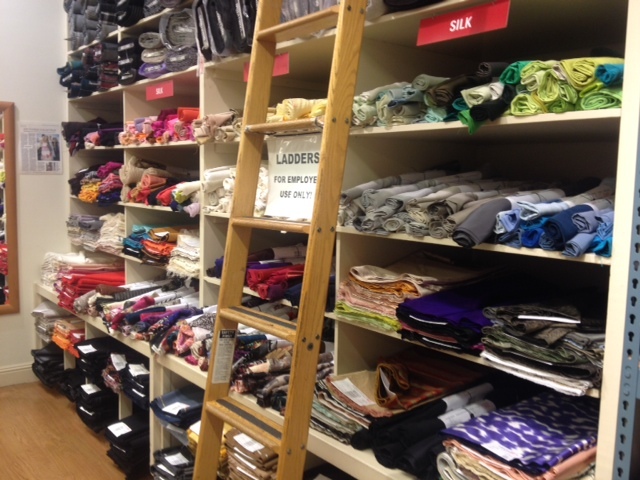 A great place for bargain hunters not looking for something specific. Since the two stores are so close together, it was worth a visit to hit them both. Discount Fabrics, 2315 Irving St, this location has lost the lease and in May will be consolidating with their store at 201 11th St. (I didn’t bother with a photo since it won’t be there long). The rolls of fabric were crammed in barrels so tight it was difficult to move them to see the selection and many of the notions looked like they had been around for a long time. 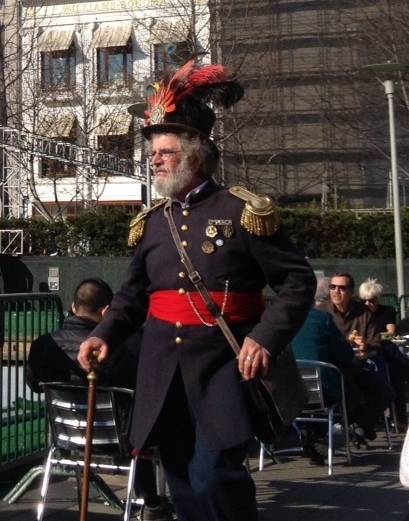 The hotel concierge suggested the neighborhood around the 11th St location could be risky. 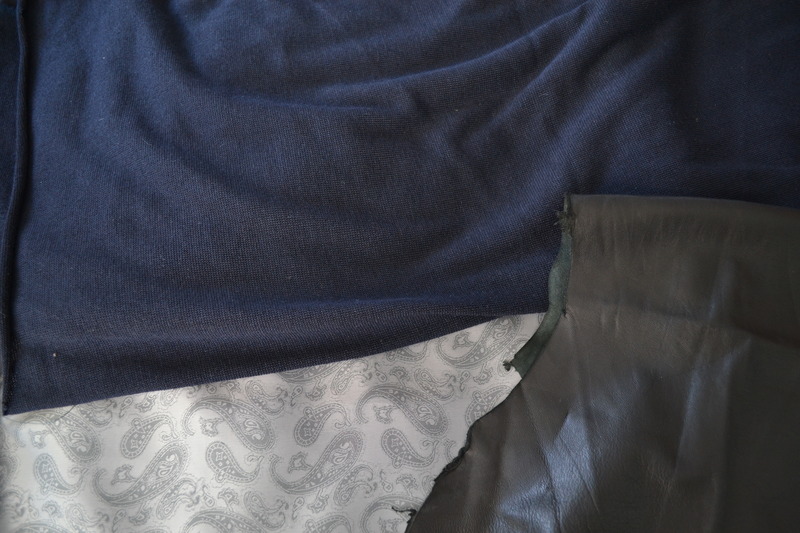 Purchases – drapey sweater knit, paisly lining and a piece of black leather. 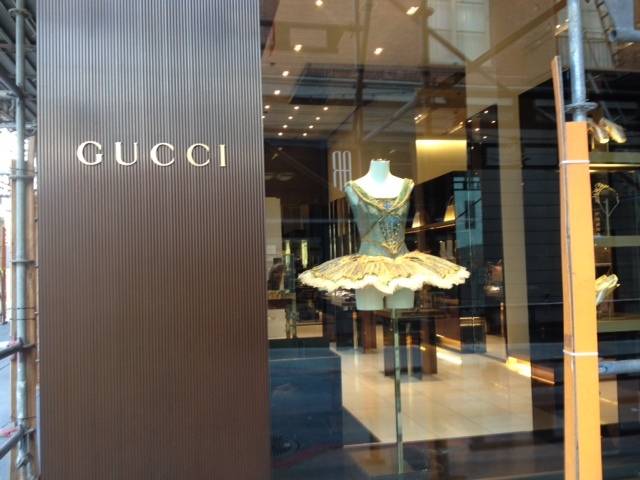 If I have a chance to return to San Francisco, I’ll skip this store. 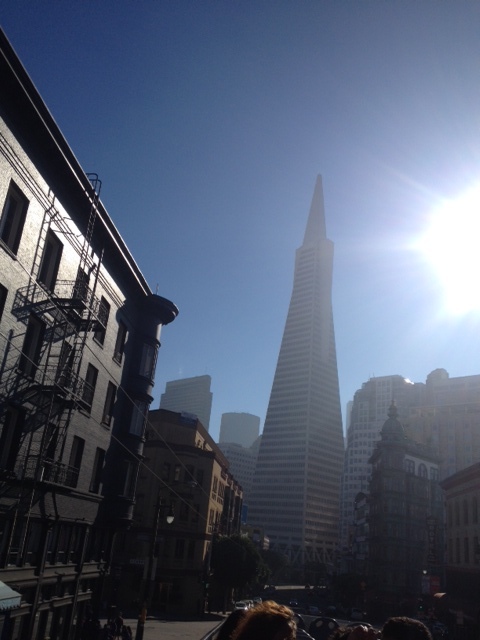 San Francisco offers inspiration everywhere, and leaving the cold an snow behind for a few days was wonderful. 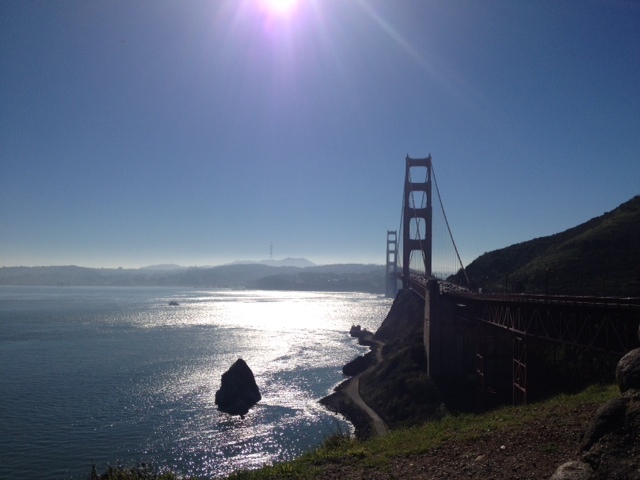 Just a side note: The best museum I visited was the Walt Disney Family Museum located in the Presidio, overlooking the Golden Gate Bridge. The wonderful exhibits, photos, film clips, memorbilia and art work spans Walt’s professional and private life in a very personal way. Anyone who grew up watching the Wonderful World of Disney will love it. My suitcase was a few pounds overweight, but maybe since my husbands suitcase was light, I didn’t get charged extra. So glad to know you are on the road to recovery. Isn’t Britex just the best? 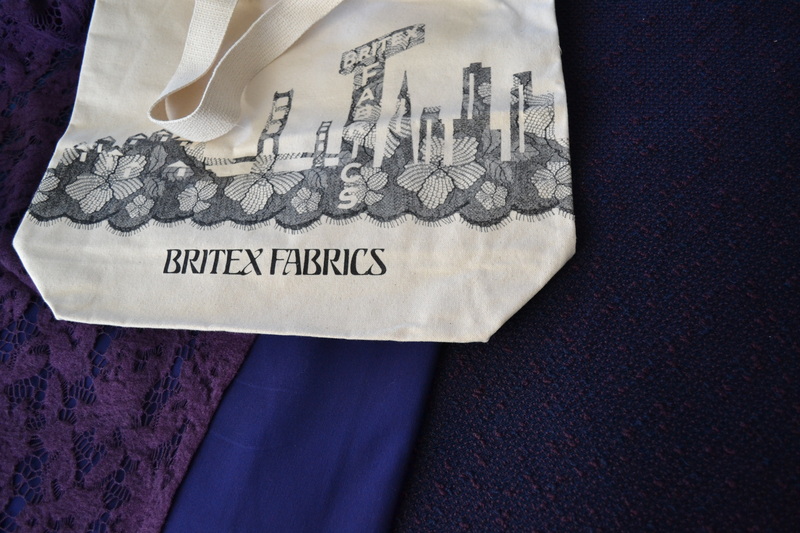 I try to get there once or twice every year (from the East Coast), and always have some Britex-purchased fabrics in my queue! What fun it must be to make regular visits. I know I missed a lot. Thanks so much, and my “focus” is improving. The visual wiggle I see out of my left eye is almost gone and I have 2 skirts made. Oh, you’re so lucky to be so close to such a wonderful resource. I could have written so much more, especially about 3rd floor with all the buttons and trims, fabulous. Hope you get to use that gift certificate soon. Thanks, my sewing may have been a little wonky for a while. I sewed without glasses or contact lenses with my nose almost to the needle. I’m back to contact lenses and reading glasses now. The tan items are bags, I thought the Satin Moon sisters had a cute logo.Episode 3 of GBSB was so fun, you’re so gracious under the pressure. Good to have you back! I am sorry to hear that you’ve had a rough few months, but hopefully it’s all up from here for you. 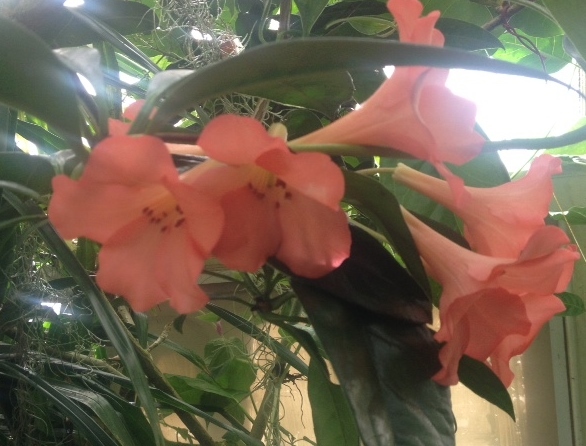 And best wishes for your mother–I hope she is settling in well. Thanks, I picked up the latest copy of Threads Magazine today and surprise, the same frog is on page 60, used on a jacket. So happy to hear from you again. Isn’t Britex wonderful. I wind up there every few years and always return with new finds. Hopefully things will calm down for you and you can enjoy some sewing time. Thank you. 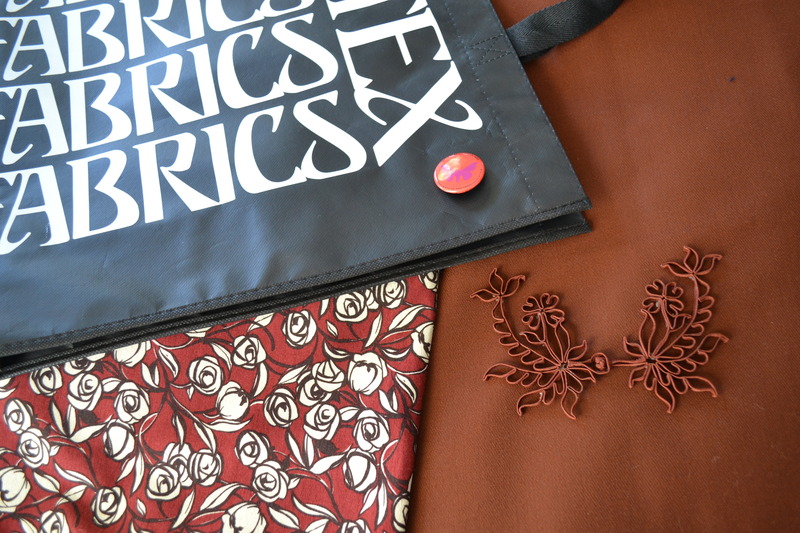 Since I quit working during all the chaos, I have been able to sew and really enjoy the slower pace.. How wonderful to make regular visits to Britex. Do you plan ahead a go with a list? Or just wing it?